The first of the major CDT infrastructure projects is now open. 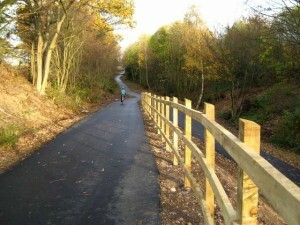 The long-awaited official opening of the latest section of the Chester Millennium Greenway took place on 25 October 2009. Residents of Guilden Sutton and Mickle Trafford now have a traffic-free route into the city centre, and Chester residents have better access to the countryside to the east of the city. The new stretch includes a new pedestrian bridge over the Chester to Manchester railway line as well as a series of links and access points. These are situated in Fairfield Road, Mannings Lane (South), the A41 at Greenfield Lane, an access point near Guilden Sutton, and Station Lane, Mickle Trafford. 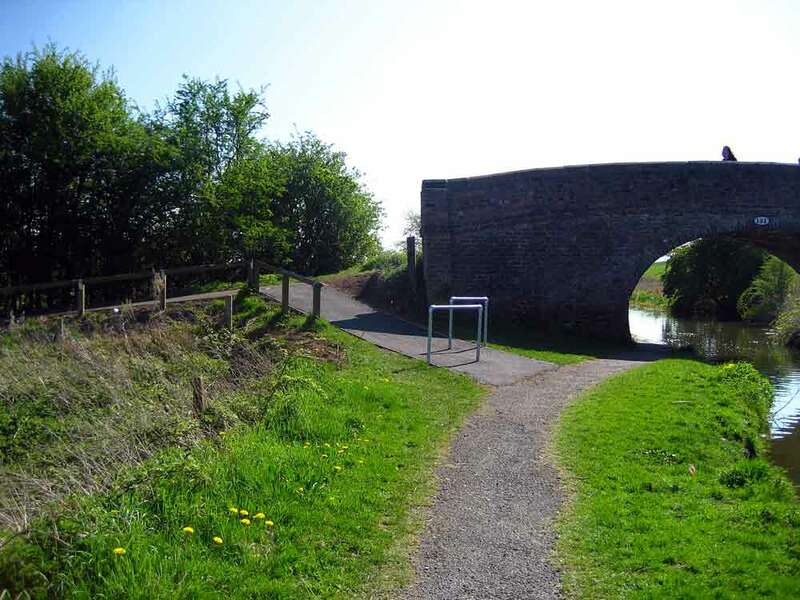 To mark the opening, the Chester Cycling Campaign has created a photo gallery providing a good overview of the new Greenway Extension. Work on the project started in June 2009. 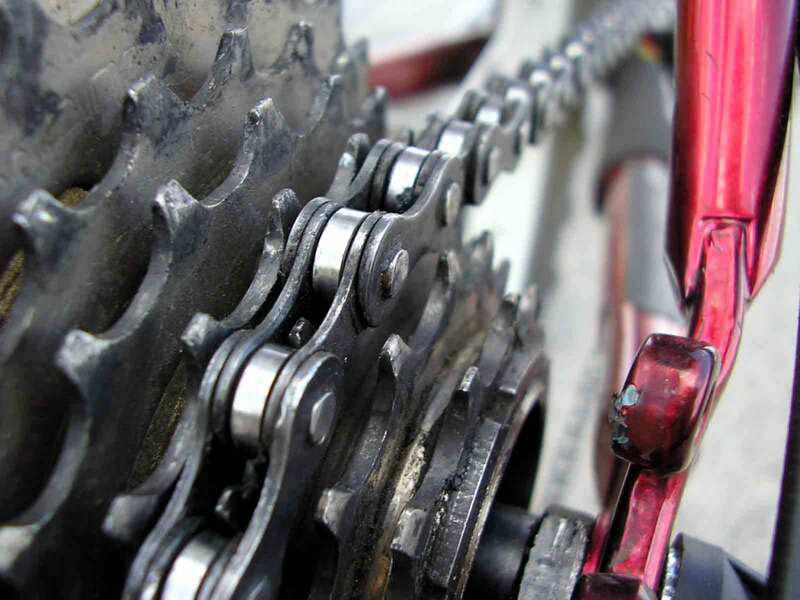 The 16 week scheme was funded by the Northwest Regional Development Agency (NWDA) as part of REVIVE – the project which aims to reclaim 170 hectares of brownfield land in Cheshire and Warrington. A detailed description of the route and the history of the campaign to save the route from the misguided Guided Busway proposals and to get the extension built are included in Steve Howe’s excellent Virtual Stroll website. An active group of volunteers, Friends of the Millennium Greenway, have worked long and hard campaigning for the building of the extension. The opening of the extension is a tribute to their hard work. The group organises periodic planting and maintenance days on the Greenway. Please support these volunteer days if you can spare a couple of hours. I found it disgusting that some cyclist that are using the path attitude sticks. Walking my dog down there with my partner found most cyclist at speed flying around corners and the vocal abuse was horrible. Local families with small children use this walkway. Like me when I ride my bike I use the main road. And don’t give attitude. Don’t know what it is with these so called Sunday riders. The millennium greenway is for everyone. Users should respect each other and under no circumstances monopolise or in any way seek to exclude other users. I have lost count of the times I have been verbally accosted by cyclists , who seem to think that every other user must get out of their way, keep the walk way clear,and allow them to race at high speed from (a) to (b). Having recently taken to cycling again, I was pleased to find the Greenway as a traffic free route to get about and just for cycling pleasure. That pleasure is somewhat diminished by the usual mix of thoughtlessness and ignorance: cyclists going too fast and not giving warning of approach, dogs on the loose and walkers not giving way when asked.The speeding cyclist problem will end in tragedy, it’s just a matter of when.The loose dogs problem could be sorted very easily by insisting that dogs be kept on leads at all times. Selfish walkers? We will just have to put up with that one. Disgusting attitude. If you want to ride your bike get on the main road. I walked with my dog there today and being a cyclist, was annoyed by the attitude of some cyclist. never leave a comment without leaving your name , coward keyboard warrior , as for some cyclists yes they have a bad attitude but so do some walkers and dog owners especially those who walk a dog on a water skiing length lead !! I live in Hoole and walk my dog Jess every day along the Greenway to Mickle Trafford. Jess loves the freedom to chase squirrels, she has never caught one. Th e friends of the Greenway are in the process of constructing a wildlife pond and plan to fill it with pond plants and wild flowers around the edge’s, this should be completed by the Spring and will make a wonderful addition to the Greenway. If I had to make a criticism at all, it is that a tiny minority of cyclist are not aware that it is a shared path and not just a cycle track. Like you say its a shared path so dogs need to be kept under control rather than ‘chasing squirrels’. I agree some cyclists are irresponsible but so are some Pedestrians. Whilst cyclists should slow down if they have to stop while every dog walkers restrains their animal it would make the cycle path too restictive / time consuming for commuting. I ride a bike on the path every other day as I walk my dogs on the path every day near Guilden Sutton over 6000 miles last year on bike and walking, so I am able to see both points of view, but the one point I cant see is why cyclist do not say THANK YOU ? Its manners when all said and done and when you slip into you tight lycra then I would imagine that some of you must leave NO room for your manners. It works both ways the idiots on here saying pick up your mess and keep your dogs under control need to see it from both sides. Most people do and most cyclists do slow down and most will acknowledge a walker child animal what ever. But to the detriment the few that are Just hell bent on getting the best time on Strava and Map my ride then its you that will no doubt be moaning about the speed humps now in place. So its up-to you keep it down or the speed bumps will no doubt role out the length of the track and beyond. My family are delighted that the Greenway cycle track is now open. The stretch between Mickle Trafford and Newton is particularly attractive. Weekends are very busy with walkers and cyclists enjoying the countryside and plenty of exercise. Unfortunately, recently some thoughtless motorist parked their car at the Mickle Trafford exit completely blocking the gateway for the cyclists. Please can we have a ‘No Parking ‘ sign here or a bollard at the roadside. What is the distance from Northgate to Mickle Trafford? My Girlfriend, her family and I went for a walk from Newton to Guilden Sutton along the new path, it was an excellent walk for all involved, we even took a Six year old who thoroughly enjoyed all the Sculptures along the way, we walked about 6 miles in the end, coming off the path then rejoined it further down. I highly recomend this walk to everyone. Well done to all involved. I cycled along the new path today with my family and it was a fantastic ride – safe, calm, superbly smooth tarmac and lots of like-minded people to say ‘Hello’ to. If only all cycling was as good as this! Well done to everyone concerned.